This third post in a series of Ed Tech Blog posts focusing on different options within the Moodle Assignment Activity focuses on different types of grading functions. So far this semester, I’ve introduced the options of the Download All, Offline Grading Sheet, and the batch upload features of this tool to help grading be a bit less time consuming (less downloading/uploading time). Today I describe two “Advanced” grading features available in the Assignment Activity: Rubrics and Marking Guides. Many of us use rubrics when creating our grading schemes especially for larger papers and projects. Rubrics like this are very helpful for both instructors and students because they more deliberately outline the expectations for student work. Research does demonstrate that the simple act of providing (and describing) rubrics prior to students beginning work on their projects can help to increase student performance (cite). Of course the students need to actually pay attention and use these rubrics as they build and revise these projects, but it does help facilitate communication of expectations. Criteria are listed and described and a total point value is determined for each criteria. Graders are able to type in feedback into textboxes for individual criteria and for overall comments. Graders are able to select a point value range that is allowed by each criteria. The benefits of building in these types of grading structures within Moodle include being a bit more efficient with grading and scoring. Moodle will automatically calculate the total score for you when you use these features. Rubrics are nice because graders can just click the cell they determine the student work to be at. Additionally, you have the option of making these grading criteria for marking guides and rubrics visible to students within the assignment activity itself, so students are aware of how they will be evaluated. Additionally, when students receive a grade they see the same rubric or marking guide and can see why they have missed points or done well. Some weaknesses of using these grading structures include not being able to use the Offline Grading Sheet to batch upload grades. You can still to a batch upload of feedback files, but because of the need to enter in the individual rubric criteria, the offline grading sheet is not possible. Another weakness specifically with the Rubric option is that the points allocated to each cell cannot be altered when grading. What I mean by this is that clicking a rubric cell is an all-or-none action. Keeping this in mind when building the rubric is important. In my own use, I have found that I sometimes ended up giving much higher or lower scores than I believed was really warranted because I was tied to the points on the rubric and these did not allow me to give more nuanced grades. I personally tend to find the Marking Guide a nice compromise to this issue because I am able to give a range of points within a grading criteria. Building these can be a bit time consuming and I would recommend including these in your courses after you have built up most of the rest of your course first. You can always grade using the simple grading method. It is also possible to create rubrics that you use for multiple assignments (for example, the same rubric is used for all drafts of a paper or is used for all of a particular type of assignment). Below is a series of videos on how to create Rubrics and Marking Guides in Moodle. This entry was posted in E-learning, Moodle Basics, Online Teaching and Learning, Uncategorized on November 6, 2018 by christopherson. Content creation is something that we as instructors and faculty engage in often. This is commonly seen as creating our lectures or PowerPoints for our classes or creating activities and worksheets for our students to complete. There are many ways that we can choose to present content: print textbooks, electronic textbooks, interactive ebooks, online lessons, webpages, pages within learning management systems, videos, and audio (podcasts). In this blog I want to discuss two tools available to faculty at Morningside that can allow you to create interactive content for your courses: SoftChalk lesson builder and VidGrid interactive videos. Many of you have likely heard the name SoftChalk, many of you may not have. SoftChalk at its core is a content delivery system. It is an online tool for creating and delivering content to students in ‘lesson’ form. Here is a quick example of a SoftChalk lesson that I have built. Learning to use SoftChalk is relatively easy, but because of the many different features for displaying and embedding content and for creating interactive opportunities one can easily be overwhelmed by the sheer options there are for creators. How is SoftChalk different from Moodle? First SoftChalk is really intended to be a part of a Moodle course and not to replace a full Moodle course. Second, the interface (feel) of a SoftChalk lesson is a bit more linear than Moodle might be. Third, SoftChalk allows for different forms of activity and content interaction than Moodle can provide. Let me break these down just a bit: First SoftChalk is NOT a Moodle substitute. Though it seems that SoftChalk has many of the same features as Moodle, it would be unwieldy to create one SoftChalk lesson to replace a full Moodle course. SoftChalk does have a ‘Score Center’ where performance on the activities can be recorded, but it is not the same as the Gradebook feature in Moodle. SoftChalk is intended to present specific content and related activities WITHIN the LMS environment. Second: SoftChalk is more ‘linear’ than Moodle. When working through a section in Moodle, it is not uncommon for a student to need to click back and forth to go from content to content (file by file) and content to activity (content to assignment). Within SoftChalk learners are presented with a series of pages that they progress through. Each page can include multiple pieces of content and activities. Third: SoftChalk has different types of activities. SoftChalk does have activities similar to Moodle such as quizzes, but what it does not have is the ‘dropbox’ (i.e. assignment) tool of Moodle. However, SoftChalk does have some interactive activities that are different such as sorting activities, crossword puzzles, different types of drag-and-drop, labeling activities, interactive tabbed call-out boxes and the like. Mostly intended to provide practice and formative feedback, SoftChalk allows for the learner to interact with the content in a variety of ways. You are likely aware that Morningside has a video creation, storage, and editing tool called VidGrid (formerly Ilos). For those who are interested in creating video content, VidGrid offers a number of interactive features for their videos. If you want to learn more about how to use these tools or whether these might be the best tools for what you want to accomplish, please feel free to contact me for a consultation. On Tuesday Nov 5 at 3:45 I will be hosting a development session for NEW USERS to SoftChalk. A SoftChalk 2.0 session will be held later this year. This entry was posted in Uncategorized on October 30, 2018 by christopherson. This week Susie and I will be facilitating a faculty development workshop on the topic of alignment. Alignment in instructional design terms is the connection between the course assessments, activities, materials, and outcomes. Designing a well-aligned course helps ensure that what we expect students to do/accomplish is actually what we are asking them to do/accomplish. The Quality Matters rubrics have a large alignment component present. There are six specific standards that evaluate the alignment within an online/blended course. Each of these standards are considered Essential (3 point) standards which means if they are not met, then the course cannot meet Quality Matters expectations. Standard 6 in the Quality Matters rubric focuses on the course technology and includes an alignment standard (6.1). Quality Matters Standard 6.1 states “The tools used in the course support the learning objectives or competencies” and basically evaluates whether the technology tools within the course help students to meet the course and module outcomes appropriately. For example, the use of a discussion board to simply address an outcome that focuses on a student ‘Identifying’ information is probably not the best alignment. Discussion boards are best used to help students “discuss,” “evaluate,” “debate,” or “argue” topics. An instructor who uses a discussion board simply as a way for students to identify information is not utilizing the technology to its benefit and frankly these “discussion” are probably pretty boring! The opposite can also be true. If an instructor is using a self-scoring quiz to evaluate students on highly complex cognitive skills such as “creating,” “prioritizing,” or even “analyzing” is likely not using the best technology. The task in choosing a technology tool is to choose the best tool for the job. Sure you could use a hammer to install a screw, but it’s not the best tool for the job. In addition to finding the best tools to accomplish the outcomes of the course, Standard 6.1 also states that students should be informed in some way why the technology is being used. Making clear to students why the instructional choice of a discussion board can help students to understand why student-to-student interaction is the best way to address a particular course outcome. Explaining why you are asking students to utilize a social media site will help students best use that tool for their learning. Any technology that is used in the course should be used in an attempt to vary the learning activities and assist the learner to engage in active learning. Online courses cannot simply be a text-only repository of information for the student to passively absorb. Technology allows for active engagement with information and with others to help facilitate learning. QM Standards 6.2 and 6.3 focus on evidence for this type of active learning and variety in technology tool use. This is not to say that you should use a dozen different technologies, but rather enough variety so that students have a number of different ways that they can interact with the material. Finally QM standard 6.4 focuses on student privacy and the use of technology. There are a number of ways that programs can mine and use personal information. To meet QM standard 6.4 the students must be provided with a list of the privacy policies of the technologies used in the course. There also needs to be evidence for the protection of student privacy and data within the course as well. For example, if using social media, the utilization of a closed group helps to protect student privacy. Allowing students to use a pseudonym on a public tool outside of the LMS is also a measure that you can allow to help student privacy. And though it is not a part of a QM evaluation, any time that you plan to use an external tool that requires students to create an account and provide even basic information, you should evaluate 1) the companies policy on the use of user data and 2) whether there is some reason to be suspicious of how the program might use user information. The gist of Standard 6 is to evaluate the course designers/instructor’s use of technology tools for the purpose of achieving the course outcomes. Technology tools should not be used for their own sake and when a technology decision is made for the course, it is helpful to let students know why that choice will help them to achieve the course goals. It can be very easy to go overboard and try a number of different tools (I know I’ve been guilty of this). It can also be easy to simply use the tools that are common. Finding the right balance will help students to be exposed to the course content in different ways and use the right tools for the right job. This entry was posted in Uncategorized on October 23, 2018 by christopherson. This summer, the International Society for Technology in Education (ISTE) has publicly announced a more focused initiative to promote digital citizenship (ISTE Blog, July 2018). Digital citizenship is not simply online safety practices. Online safety includes maintaining good practices such as strong passwords, not becoming victims of phishing, spear fishing, or other social engineering digital attacks, and protecting one’s identity in online spaces. Digital citizenship is not simply about protecting yourself or your institution online. It is about creating a meaningful community, engaging in respectful debate, helping to shape public policy, and engaging in effective digital information literacy (ISTE Blog, July 2018). Digital citizenship is meant to combat the tsunami of cyberbullying, trolling, toxic comments, online arguments, and fake news that we all see in our online environments. Similar to being a good citizen in one’s physical community, one needs to be a good citizen within their virtual environments. As we move into this week where most of our undergraduate students will participate in their local community through Into the Streets, we need to remember and remind ourselves that citizenship is not limited to our physical geography. What is perhaps most important to remember is that people who are not good digital citizens can (though certainly not always) actually be generally respectful people IRL (in real life). The anonymity and physical distance provided by the online environment can provide temptations for individuals to engage in actions that they otherwise might not if they were able to be identified. I explored this very issue over 10 years ago when I was in graduate school and today these same psychological principles continue to contribute to the sometimes toxic nature of the Internet world (see Christopherson, 2007). Be vigilant about fake news and spreading misinformation. Stop and think before forwarding or sharing a post. Help others to identify these types of fake stories and images. See FactCheck.org for strategies to identify fake news and images. Use digital mechanisms for engaging in social policy. Engage in meaningful debate, post well researched solutions, share perspectives, use digital means to raise funds or awareness for meaningful causes. Use digital materials ethically. Appropriately give credit for multimedia you might use. Do not use someone else’s materials without permission. Check for the permissions that are provided by the creator. Familiarize yourself with the copyright of information and materials you use (creative commons as an example). Model digital citizenship through all online interactions and communications. If the concept of fostering digital citizenship is of interest to you, I encourage you to explore ISTE’s site on Digital Citizenship. Though ISTE is more focused on the K-12 educational environment, these basic principles and ideas can be translated into higher education. This page provides a number of short articles on ways to incorporate digital citizenship into the classroom and how to create learning activities (such as problem-based learning and authentic learning tasks) that help students engage in digital citizenship. Christopherson, K.M. (2007). The positive and negative implications of anonymity in Internet social interactions: “On the Internet, nobody knows you’re a dog.” Computers in Human Behavior, 23(6), 3038-3056. This entry was posted in Uncategorized on October 2, 2018 by christopherson. When Susie Lubbers sent out the interest survey before the start of classes one of the items that faculty appeared to have the most interest about was how to incorporate active learning strategies into their courses. On October 15th Susie and I will be facilitating a faculty development workshop on this very topic, but I also wanted to write a few specific blog posts highlighting some tools that you might find helpful to incorporate more active learning. First, what is active learning? I’ll give you my own definition: Active learning is any learning activity where students are directly involved in some or all of the process of learning something new. Students might be involved in the creation of the content, explaining meaning, organizing content, creating connections between ideas and concepts, or creating a meaningful product that demonstrates understanding. Active learning in my view can happen in any form of classroom: Face-to-face, online, flipped, traditional lecture, student-centered, etc. As long as your students are doing and demonstrating something more than simply listening/reading to content and recording that information down, there is active learning happening. Several of us have asked students to do tasks on a whiteboard such as writing ideas for everyone to view, putting ideas into categories, reorganizing information, or even sometimes providing a backchannel mechanism for posting questions. Padlet allows for this do be done. 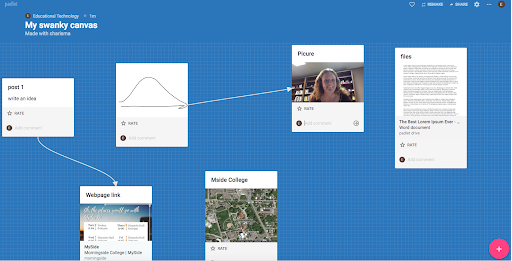 Padlet is free for students and teachers to use, and if a student is simply using (i.e. not creating) Padlet, the student does not even need to create an account and is able to use this tool as a ‘guest.’ For teachers, the free ‘basic’ version allows you to have three padlets created at any one time. And unless you plan to keep a particular padlet long-term this probably is a fine choice of plan. The individual pro plan is $8.25 a month and along with the ability to create unlimited padlets, there are other features such as folders, no ads, and larger memory capability. Padlet can be used on computers or mobile devices and there are a variety of ways to share the Padlet that your class might be working on. On computers, you can simply send a link or you can embed the actual Padlet window into a course Moodle or Website. If your students are using mobile devices, they will need to install the Padlet App, but then they are able to access your padlet through a link, QR code, of even through a ‘broadcasting’ feature that the presenter can use if sharing using a mobile device. When posting to a Padlet, users have the options to post text, files, images, Google Suite applications, and even other Padlets. You can enable comments or ratings to be made on posts as well. Padlet is one of those tools that might help faculty with larger courses to get more student engagement or to allow those quiet students participate in class in a different way. This entry was posted in Communication on September 25, 2018 by christopherson. 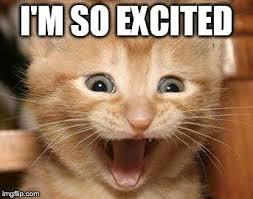 Bear with me in this week’s blog post – I’m about to get a little ‘fan-girl’ crazy here with Moodle. And for anyone who knew about these bulk grading and upload processes and never told me…Shame! Shame! Shame! 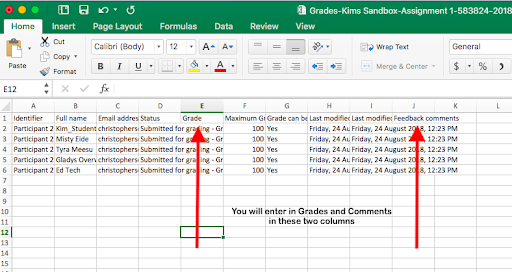 Last week I shared with you a way to help the first start of the grading processes for Moodle assignments go a bit quicker using the Download All Submission option. At that time I also alluded to the fact that this can be the first step in helping later on with submitting assignments back to Moodle. Today I share with you the thing the literally made me want to jump and shout to the world what I think will be a LIFESAVER for those of us who do a lot of electronic grading. But before I get into the really exciting part, let me share with you a few of the features in Moodle that you can use to provide different types of feedback to your students. When you create or edit an assignment you can select the different ways of providing feedback: Feedback Comments, Feedback Files, Offline Grading sheet, and Comment inline. Feedback Comments, when enabled, will include a textbox for you to write comments back to your students. Feedback Files, when enabled, will provide you a place to upload a file – most likely a Word file that you have made electronic comments on. If you have provided a textbox for your students to type their assignments into (you do this in the Submission Types –>Online Text) and enable the Comment Inline feature, you will see your student’s responses from their online text submission in your feedback comments textbox and you can comment within the student’s text (see below for what I mean by this). But probably what I am most excited about is the fact that I just recently started to explore just what this Offline Grading Sheet was all about and WOW have I been missing the boat there. When you enable the offline grading sheet, you will then be given an option in the drop-down menu where you can also ‘download all submissions’ to download the grading sheet. Doing this will download an Excel file to your computer that is formatted so that all you need to do is enter in the points grades for students on the single excel sheet. You can also write in your feedback comments on this grading sheet as well. So, once I learned about that I decided to explore the other options in that drop-down menu that I typically ignore (we truly just don’t always have the time to explore this stuff right…plus we don’t want to break the Moodle). So I explored what the “upload multiple feedback files in a zip” was. So are you as excited as I am about this? This will literally save me hours of time as I grade assignments this year. The one thing to be aware of is that students do not receive an automatic email notifying them of these updated grades and files. But this is easily done by simply clicking the “save all grading changes” at the bottom of the quick grade view. Unfortunately if you use ‘Rubrics’ or ‘Marking Guides’ as your grading type in Moodle the Offline Grading Sheet feature is not available. However, you can still do a bulk upload of all feedback files. This entry was posted in Uncategorized on September 17, 2018 by christopherson. When Susie and I had the faculty respond to a short survey, there was a lot of interest from you on learning more about the different features of two particular Moodle activities: Assignments and Quizzes. These are probably two of the most commonly used Moodle activities (Forums are also very common) at Morningside and there is probably more to them that you are aware. Even I have learned a few new strategies for using these tools recently and this year one of my goals is to share these with all of you. This Fall I focus on Moodle Assignments. 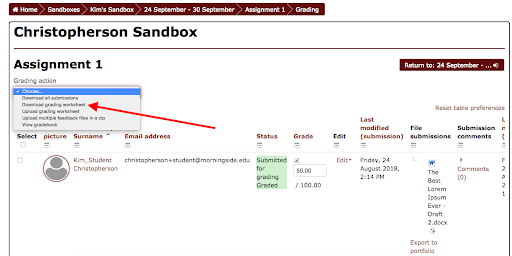 The Moodle Assignment is basically the drop-box feature in our learning management system (LMS). Instructors provide instructions and materials for students to complete and then students submit their work electronically through Moodle. Instructors then provide feedback and grade the assignments, turning them back electronically through Moodle. Here is a document outlining this basic process. There are many different options available that you’ve likely noticed if you have ever included one of these in your course. For example, there are different feedback types, different grading mechanisms, you can use something called ‘groups,’ you can enable multiple attempts, you can use a ‘quickgrade’ or you can grade students one screen at a time. I’ll discuss using some of these different features in future blog posts, however, In this installment I want to give you one tip that might help the grading process go just a tad bit faster – the Download All Submissions feature. 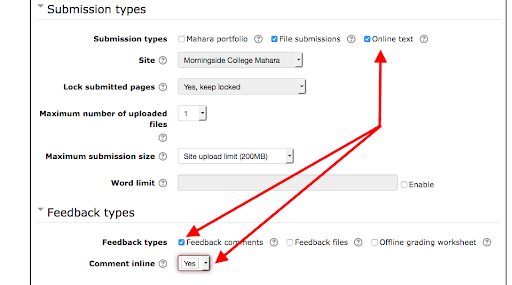 After your students have all uploaded their assignments to Moodle there are really two ways to download the files onto your computer so that you can provide feedback on their assignments. 1) you can click on each individual student file and download them individually or 2) you can download all files as a batch. There are a few benefits to using process #2: First, there is WAY fewer clicks and less waiting for downloads and second, using the download all submissions option automatically names the files with the students names. So you don’t need to depend on students properly naming their files for you to identify them on your computer! Here is a short 30 sec video demonstrating how to do this. The one drawback that I can think of is this. You really need to wait until after the due date to use this bulk download process in the most efficient manner, so if you are someone who likes to grade as assignments come in, this process might not be the best to use. This bulk download does not recognize if you have downloaded the same file previously. It’s still possible to use it, there is just more file management that needs to occur on the instructor’s end (i.e. moving new files into your assignment files and ignoring student files that you have already saved). This process can help speed up grading by basically reducing the time it takes to download each individual student’s file to your computer. Additionally, using this process also makes it possible to do a type of bulk upload (to be discussed in a future blog post! – This is a feature I just learned about myself). This entry was posted in Uncategorized on September 12, 2018 by christopherson.